A co-workers wife is due soon, so I volunteered to create a card. I hope there is no disappointment. They are not sure if they will have a boy or a girl so I did bright colours in gender neutrals. I am still without my tripod…. I know get over it already. Anyway my card portrait is not as good as it should be and does not show the ultimate cuteness of this card. We have a few staff to sign the card so I am leaving the inserts loose as the baby pin buttons are not going to be very easy to write over. 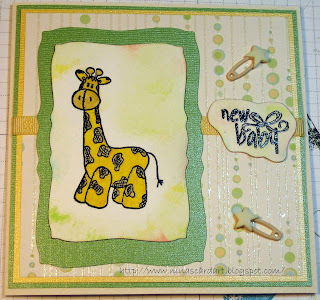 Supplies: Green and yellow cardstock, Designer paper – DWCV Nana’s Nursery, Inkadinkado – Chubby Giraffe, Congratulations and New Baby, Jesse James baby bling buttons, misc ribbon. I really do need to get out and buy a tripod, my sister gave me another option but I am stubborn. So please excuse my picture taking once again. This image really does not do the colours in this card justice. There are crystals in the middle of each flower that does not show that well. 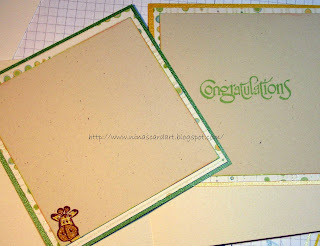 Supplies: Cream and aqua green cardstock, Designer paper - Daisy D’s, Denami Design – Stampin’Up! Sassy Stems, Stampendous – Simple Happy Birthday, misc tan and green ribbon, Jolee’s jewelry flat back crystal. This is the second card from this weekends Close to my Heart gathering, we used a brayer to get the varients of yellow to orange. Supplies: All supplies Close to my Heart. Today’s card was one that I made at a Close to my Heart workshop. I really enjoyed the projects yesterday. The first one was using Rub-Ons on a glass picture frame, I can’ t really show that one as I don’t have a picture in it and that will take careful consideration. The second and third projects were both cards. The first card was a 2 layer card. The first layer we made our own design using a floral stamp set (sorry I could not find it in the idea bookfor the name) and a variety of inks. The second layer was a simple phrase, we added some buttons, rickrack and some glitter. Basic, simple and cute. Supplies: All supplies are Close to my Heart. I apologize for the so so card portrait, I broke my tripod and need to get a new one so until then it is free hand outside the light tent. TGIF, the sun should be shining, it is the end of the week and am looking forward to a couple of days at home. 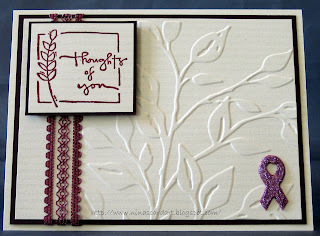 I centered this card around the Breast Cancer ribbon, I could not find a stamp or a punch for this although I think there are variations of both out there. I used a random ribbon off the internet then used Diamond glaze and glitter to create this little embellishment. I layered it 2 times to give it dimension. I embossed the Thoughts of you with Burgundy embossing powder and used a Cuttlebug Leafy branch to emboss the cream card stock. Cancer... what a nasty evil disease. Supplies: Cream and burgundy cardstock, Leafy branch - Cuttlebug embossing folder, Thoughts of you - Katie Hall Studio G, Glitter Ritz - Lilac Pink, misc ribbbon. 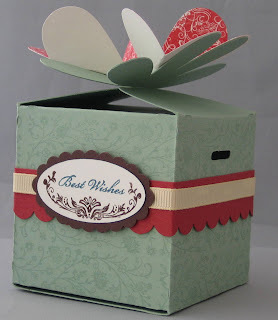 Isn't this little box cute, I think the template for it is from Cricut. Boy did I struggle with putting this together, you would have though I had 6 hands in there foldering. In the end I think it turned out ok although nothing will be put in this box as it is glued up tight. The top has these sweet little punched hearts in red, I tried to take a picture but it just did not turn out so you will have to take my word for it. Actually a couple of the projects were made with Cricut templates for this workshop, my husband says I am not allowed to have one which is fine because my credit card could get into all sorts of trouble if I started down that path. 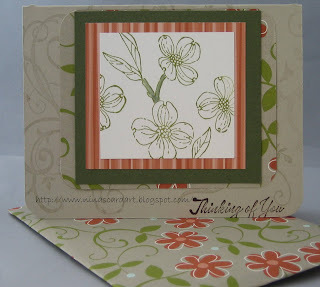 This card was very simple to make and turned out pretty. I love the shape of this card. 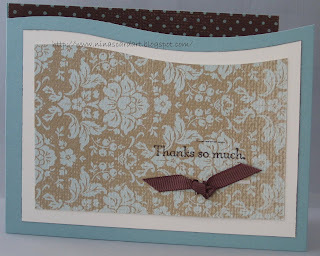 The Stampin' Up textured paper is very pretty. I was still running with my stamping issues though. The April Stampin' up! workshop was yesterday, I was happy I attended as I liked all the projects. You ever have those days when your craft mojo is just not flowing. Mine was yesterday, I felt like my hands were unattached and I could just not make it happen. I WILL show you my results anyway, even though they are sloppy. I'll post the worst one first, I tried to fix it a little when I get home, the bad vibes followed me home and I just made a mess. That will teach me. 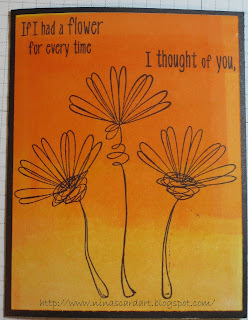 I really liked this card, it comes with a Cricut generated envelope, I love the neutral colors. 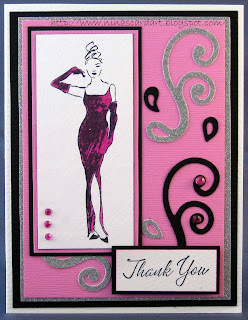 Supplies: Cream, pink and black cardstock – The Paper Company, Silver Glitter paper DCWV, Stampin’ Up! 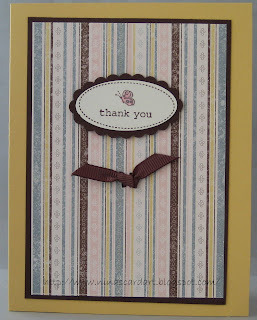 Warmest regards (Thank you), Sprites Floral Embellishments - Prima, Dashes, Dots & Checks velvet ribbon, Misc ribbon buckle, Doodlebug Design inc - sugar coated brads. TGIF, what a brutal week *wink* I think I could really get use to a 3 days work week. Another card in the 'Pink" Series. Same type of layering just not as much of it. I love the Sizzix-Scribbles Swirls they are so pretty. The Thank you is once again popped up with pop dots. 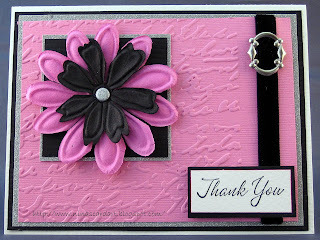 Supplies: Cream, pink and black cardstock – The Paper Company, Silver Glitter paper DCWV, Stamp-it - Audreyesq, Stampin’ Up! 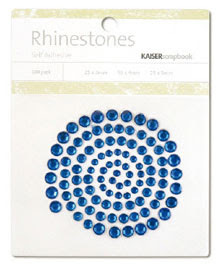 Warmest regards (Thank you), Kaiser Scrapbook-Rhinestones, Sizzix-Scribbles Swirls. Lots of layers here, this card was orginally going to be on pink cardstock but it was just a tad over powering. So I switched to a textured cream and it worked out much better. I have layers of black and pick cardstock with a layer of silver glitter paper sandwiched. I had isssues with the alighnment with this one, I was definately no one with my glue runner. 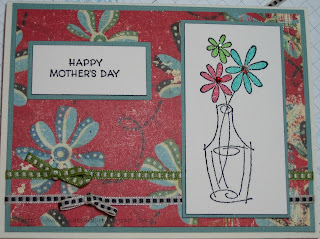 I used my Cuttlebug with Swiss Dots Embossing folder to add texture to the main pink layer. The Thank you is popped up, along with the center shoe. The shoes are all coloured with my pink atyouSpica glitter marker. I was able to use some of my sparkly rhinestones that I was so happy with in a earlier post. I loved this stamp, like you have not heard that before. So when I sat down to make a card, this stamp was the focal point. As always I like layers, so I used my Cuttlebug to emboss Birds and Swirls on the aqua cardstock, I used my Spellbinders Large Labels Nestabilities to die-cut the watercolour paper for the birds stamp. I coloured the birds with a mix of my watercolour pencils and my atyou Spica markers to give them a little sparkle. I wanted to use a ribbon slide but the brown ribbon was not quite wide enough so I added the sheer pink. The stamped Hello phrase is raised on pop-dots. 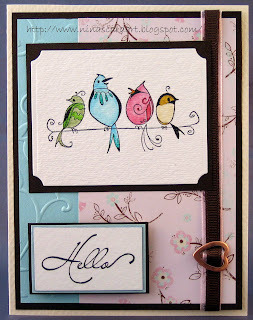 Supplies: Cream, and aqua cardstock, metallic brown designer paper, Making Memories Noteworthy Audrey – Designer paper, Inkadinkado-Birds and Birdhouses, Inkadinkado-Hello, misc ribbon slide, Offray brown ribbon, Modern@home pink ribbon. I hope everyone had a wonderful Easter weekend. I had not planned on not blog for 4 days but it sort of just worked out that way. I relaxed a great deal, did a little gardening and watched the copious amounts of rain pour down. Today the sun is shining, I took a vacation day and have the day to myself, all is good. I coloured the flowers with my atyouSpica glitter markers, then added the crystals. The card portrait really does not show the glitter or the sparkle. 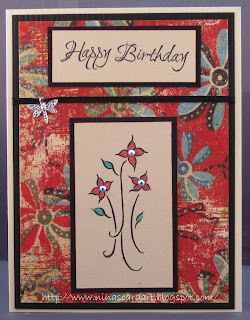 Supplies: Cream, kraft and black cardstock, Designer paper - Daisy D’s, Denami Design - Small flower spray, Paper Inspirations – Happy Birthday, Black – Spool o’ Ribbon, misc butterfly charm, Jolee’s jewelry flat back crystal. I was wrong yesterday, I have a card to post. This was a Thank you card to my super talented sister.. Barb. I begged and pleaded with her to make me some designs for stamps so that I could stamp the back of my cards. She did the most amazing job, I took the designs to a local custom stamp and engraving place and they turned out fabulous. I don't have a picture of a back of a card, I will do that next round of portraits and post. I will show you one of the designs. Barb, I am so proud of your talent I hope you don't mind that I share. I have one for every season. Can you guess which one this is? 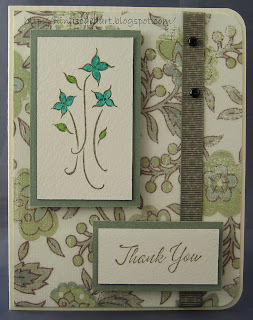 Supplies: Sea green and cream cardstock, Designer paper - Wild Asparagus 'Cousins' Floral, Denami Design - Small flower spray, Stampin' Up - Thank you, Misc shiny black brads, WeR Memory Keeps Designer ribbon. I have not had the chance to make any cards over the last week or so. I hope to get some time this weekend to play nice with my craft supplies. The last time I was in the local stamp store they had some new sparkles that I can't wait to use. 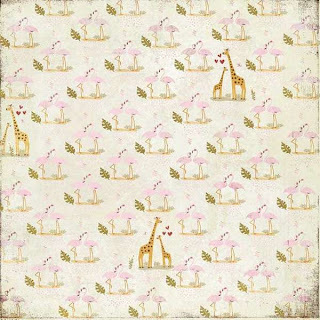 Judy you had asked me where I found the Flamingo paper, I found it when I was looking at all the Basic Grey scrapbook paper at one of the local scrapbook stores. Here is the link to the company website http://www.basicgrey.com/. This paper is called sugared/beloved. 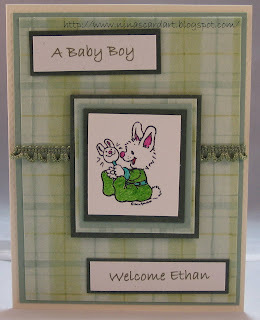 This is such a cute stamp, I used my glitter makers to add colour to the bunny, I used Microsoft Word for all the text. Supplies: Green cardstock, Aqua small Plaid Printer Embossed – Designer paper, Rubber stampede- Bunny Raffle, Multicraft Imports ribbon. Back to the grind today, I hope a good weekend was had by all. We still have company so I have been a little slack on the card making. This card was made for the arrival of a new baby. 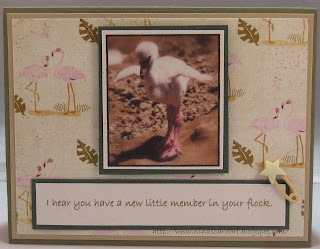 I could not find a stamp that fit what I wanted for the card so I found a baby flamingo stock image and tweaked it a bit. I used Microsoft word for the phrase. All in all I was happy with the results. 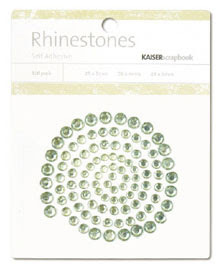 Supplies: Green and Tan cardstock, Designer paper – Basic Grey Sugared beloved, misc baby flamingo images, Jesse James – Baby Bling button. One day closer to Friday. I think it is time for a extra day or two off, the days are starting to feel heavy when I smack at my poor alarm clock way to early in the morning. The weatherman is teasing us with hints of sunshine for a few day starting later today or tomorrow, I am looking forward to it. A little gardening is called for. This was another basic card, it does say the exact message I want and it is a guy card you can't give them anything too "delicate". 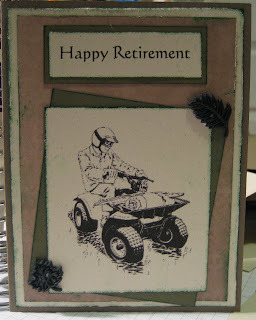 Supplies: Tan, green and craft cardstock, Happy Retirement – Microsoft Word, 4 wheel ATV – Unknown clipart, Jesse James – Raking Leaves buttons. Paying the music man. This card is super basic, I layered cardstock and designer paper four times using dimentionals on three of the layers to make them stand out. I first stamped the music note with black ink, then touched it up with my black atyouSpica glitter marker. I added some texture to the round bottom of the music note with Black Diamond Stickles. 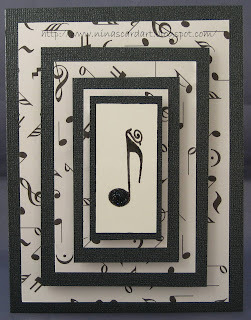 Supplies: Shiny black cardstock, Designer paper - Musical Notes by Design Originals, Inkadinkado - Music Note, glitter marker, Stickles.